Blasting off shortly before sunset in French Guiana, an Ariane 5 rocket delivered two communications satellites to orbit Wednesday for the Indian space agency and companies based in Greece and the United Kingdom. 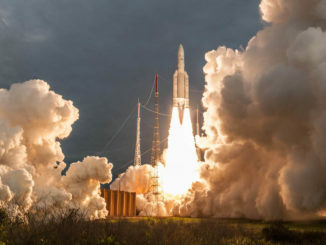 Two geostationary communications satellites rode an Ariane 5 rocket into orbit Wednesday from a launch pad in French Guiana, embarking on missions to broadcast television across Europe, the Middle East and Africa, link European air travelers with Wi-Fi, and relay video and data signals across India. 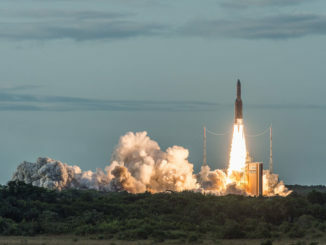 A European Ariane 5 rocket lifted off Wednesday with the Hellas-Sat 3/Inmarsat S EAN satellite designed for television broadcasting and airborne connectivity in Europe, and India’s multipurpose GSAT 17 communications satellite. 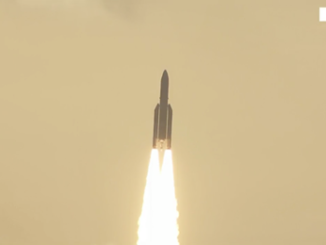 Launch from Kourou, French Guiana, occurred at 2115 GMT (5:15 p.m. EDT). 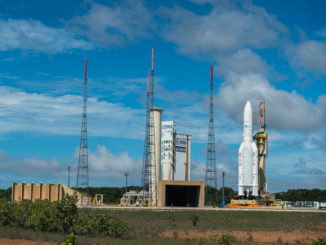 Arianespace’s launch team in French Guiana rolled an Ariane 5 booster to its launch pad Tuesday and readied the rocket for liftoff Wednesday with an Inmarsat satellite to connect airline passengers over Europe and an Indian communications craft.